For the new year I have decided to try to take better care of my skin. I have noticed it is starting to look my age and I want to look younger. The Yalmeh Super Youth-Anti Aging Serums Set #Yalmehnaturals comes with three products including .5 fl oz/ 15ml sized Vitamin C Moisturizing Lotion, a 1 fl oz/ 30 ml sized Vitamin C Serum, and a 1 fl oz/ 30 ml sized Hyaluronic Acid Serum. These are the perfect size to have to test them and see what I like. I have used them a few days and I have to say so far I really like them. The vitamin C moisturizing lotion is really nice it is nice and thick and my skin soaks it up. It has a nice light scent and does not feel greasy when I put it on. It will help make my skin look more evenly toned with extended use. The next product I used is the Vitamin C Serum will help repair my skin. You really don’t need much and it feels good on my skin. The finial product is the Hyaluronic Acid Serum which hydrates and plumps your skin to make it look fuller and softer. They all work together making your skin look and feel younger and softer. 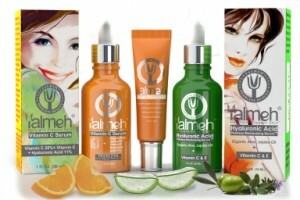 The great thing aoub the Yalmeh products are that they made with mostly plant based ingredients with no fillers. They are made here in the US in FDA registered facilities. Using all three of these products together will help your skin look softer and younger. They will work together to reduce lines and even your skin tone. I can’t wait to see how my skin looks in a few weeks. If you would like to purchase this set for yourself – you can find it on the link below from Amazon.com.